An example of mutual symbiosis is the relationship between the ocellaris clownfish that dwell among the tentacles of Ritteri sea anemones. 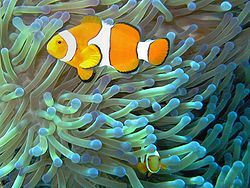 The territorial fish protects the anemone from anemone-eating fish, and in turn the stinging tentacles of the anemone protect the clownfish from its predators. A special mucus on the clownfish protects it from the stinging tentacles. A further example is the goby fish, which sometimes lives together with a shrimp. The shrimp digs and cleans up a burrow in the sand in which both the shrimp and the goby fish live. The shrimp is almost blind, leaving it vulnerable to predators when above ground. In case of danger the goby fish touches the shrimp with its tail to warn it. When that happens both the shrimp and goby fish quickly retreat into the burrow.